DocuSign is taking full advantage of the power of visuals, from the product development team revolutionizing their annual planning process with Lucidchart to the sales team using visuals to convey value to customers. 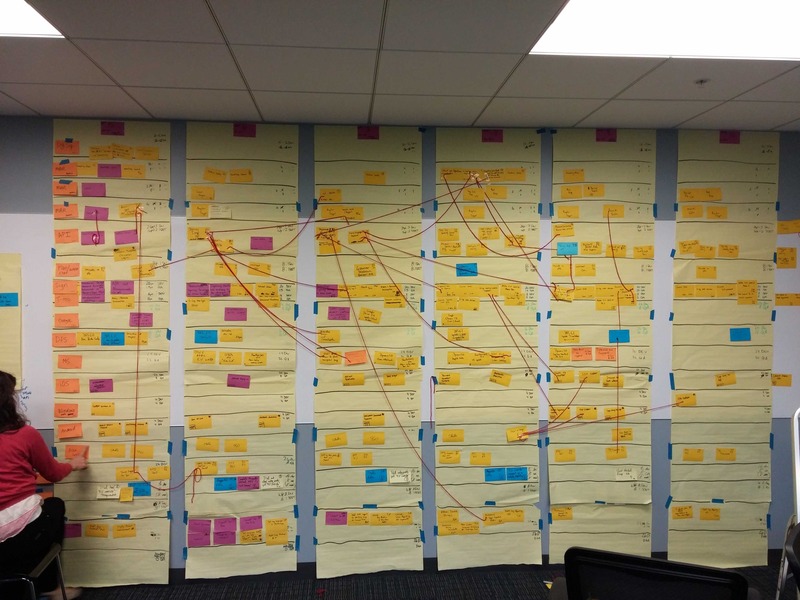 The product team moved their quarterly planning process from a collection of sticky notes on a wall to a Lucidchart document in the cloud, allowing everyone to contribute and collaborate regardless of physical location. The product team walks through the Lucidchart document together, providing feedback and adjusting the diagram in real time rather than emailing back and forth. The sales team creates professional visuals that allow customers to easily understand and be comfortable with how DocuSign will interact with or replace their existing systems. Visuals from the sales team help the professional services team fully understand the customer beforehand so they provide the optimal onboarding experience. DocuSign empowers more than 250,000 companies and more than 100 million users in 188 countries to send, sign, and manage agreements anytime, anywhere, on any device with trust and confidence. DocuSign replaces printing, faxing, scanning, and overnighting paper documents to transact business. As the Senior Director on the Program Management team at DocuSign, Jen Zagofsky was looking to improve the Product Development organization’s planning cycle. Jen was searching for ways to drive increased visibility, collaboration, and efficiency with their geographically dispersed teams in Seattle, San Francisco, and Chicago. In doing so, the team began leveraging materials around a Scaled Agile Framework. A key component of Scaled Agile is increment planning, which DocuSign performs quarterly. The prescribed planning process functioned only if all participants were in the same physical location. Very hands-on, it consisted of constructing a large product development board with horizontal swimlanes designating teams and vertical swimlanes designating sprints. Different stories, epics, or pieces of work were written on Post-it notes scattered throughout the resulting checkerboard, with strings linking the dependencies. This giant board hung on a wall and worked as a visual for getting everyone on the same page—but only when everyone was in the same location. However, with employees across multiple locations, including working from home offices, rolling out this method on a large scale to everyone simply wasn’t feasible. Rather it was limited to 30-40 members of the leadership team in an overcrowded room. “We would be in there all day, overwhelmed by this giant poster chart and simply trying to keep everyone sane until the end of the day,” recalls Kunal Arora, Senior Program Manager at DocuSign. DocuSign needed a tool that would provide an interactive, collaborative and visual experience across multiple locations. Jen began investigating tools to fill the gaps in the team’s quarterly planning process. After talking to IT, consultants, and others doing similar work in Program Management, she was surprised to discover that not a single person could offer any sort of solution for a decentralized company. As she began her search, Jen knew her requirements. The team needed a tool that was cloud-based but that also offered parameters. After experimenting with one possible tool, she found it didn’t have the constraints she was looking for—she didn’t want the planning process to turn into an art project. Armed with Lucidchart, Jen and her team were able to tackle the quarterly planning process head on, transforming it from an in-person demonstration of a paper model into a two-day collaborative process. Jen creates a Lucidchart document containing all the teams and sprint dates. Team members then take the two days to brainstorm their projects for the next few months and collectively add their specific deliverables to the document. “Lucidchart allows teams to more accurately and efficiently reflect what their commitments are each sprint. The tool helps us make adjustments to those commitments on the fly, as we have the flexibility to revise as needed. Lucidchart is working wonders for us." At the end of each day, Jen organizes a team-wide check-in. Regardless of physical location, all employees join the shared WebEx and collaborate as they walk through the Lucidchart diagram together. Everyone can see the document—there’s no need for back-and-forth emails. Throughout the meeting, anyone can edit or add comments in real time. “It’s very easy to use, yet when I need it for a complex use case such as this, I can drill down and get the functionality I need,” says Jen. The improved process has helped the team achieve a dramatic increase in their quarterly delivery rate. “Lucidchart is absolutely required for our process now. I don’t know how we would get this information ready and in front of the executive team without the use of this tool. We are very excited about this process and how it is working for us,” Kunal states. The experience exposed the product development team to the tool, and they quickly identified other areas of work where the visual and collaborative nature of Lucidchart could add value. Today they use Lucidchart to build workflows for anything from new hire trainings to quality process control. Currently, the team is utilizing Lucidchart to design an integration workflow involving DocuSign and three other parties. They are able to track APIs being called, data being tapped, and all processes occurring in between first and final outputs. The use of Lucidchart has now expanded beyond the product development team at DocuSign. As word spread about how this tool helped the team refine their processes, the request for additional licenses kept pouring in. The UX, engineering, and sales teams are among the employees now using Lucidchart for flowcharts, data flow diagrams, and other diagram types in their own work projects. Many of these are non-PC users excited to finally discover a cloud-friendly diagramming option that works across any operating platform and satisfies all their diagramming needs. As adoption has spread, DocuSign has taken advantage of the many integrations Lucidchart offers. Doing so has allowed the product to work seamlessly with tools the company already regularly uses, such as the Microsoft and Atlassian suites and Google Apps. As a company extremely focused on data protection, the IT team at DocuSign was thrilled to integrate Lucidchart with Okta to enable single sign-on for enhanced security. Jen and the product development team were especially excited to hear about the Confluence integration, which is in the process of being implemented and is anticipated to address a variety of pain points in their processes. They are looking to integrate with JIRA as well, as they currently use the application to build upon their sprint plans. The product development team started a revolution—a visual thinking revolution that has helped DocuSign improve their processes as they help tens of millions of users around the world improve theirs. The sales team at DocuSign has also become part of that revolution. As a solutions engineer at DocuSign, Sam Metzer plays a crucial role during the pre-sales process, helping customers understand the value DocuSign has to offer. But during most of these conversations, he talks to very non-technical customers about very technical concepts—all the nitty gritty details is where he starts to lose the customer. Luckily, Sam has found a way to rescue people from the weeds and draw them back in: visuals. When a customer purchases DocuSign, it replaces an existing business process at their organization. These processes can be complex and cumbersome with multiple parties involved, certain documents only legally visible to certain parties, etc. During a customer call, Sam describes DocuSign’s API in great detail or goes in depth to understand a customer’s workflow. There are a lot of moving parts, and sometimes it’s a lot for a non-technical audience to consume, especially if Sam is just rattling off information—most of it will go in one ear and out the other. But if he puts the information in a flowchart, suddenly the complex becomes simple, and people pay attention. That’s why after a customer call, Sam immediately opens Lucidchart to convert his notes to visuals. His diagrams vary in level of technicality, but all clearly illustrate the process by which DocuSign interacts with or replaces existing systems at the customer’s organization. These diagrams convey meaning in a way words simply can’t do alone. With horizontal and vertical swimlanes, Sam can clearly identify both the owners and stages of a process. He relies on Lucidchart’s shape libraries, preset themes, and custom objects to make aesthetically pleasing diagrams quickly. And most of the time, Sam doesn’t have to start a diagram from scratch. “I started using Lucidchart with the intent of creating modular diagrams that allow me to just plug and play when I am working with a customer. I can just replace pieces of the diagram to fit the level of technicality we need to get into around a specific subject,” Sam explains. He is building a repository he can pull from every time it comes time to craft a new flowchart for a customer’s use case. And using Lucidchart is a much smoother experience than Sam’s previous diagramming endeavors, which primarily consisted of fighting Visio. 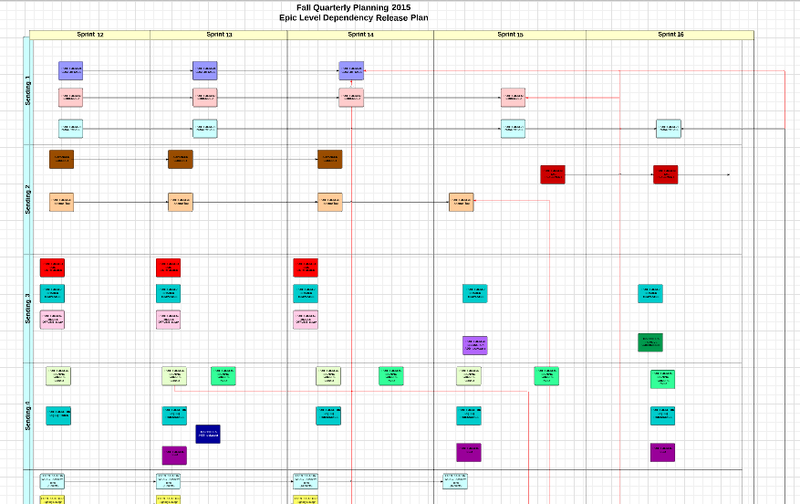 Once Sam has a finished diagram, he exports it as a PNG to email to a customer for final approval. Sam’s latest Lucidchart experiment makes the feedback process instantaneous but puts his diagramming skills to the test: he does a screenshare and creates a flowchart in real time while on the phone with a customer. This process allows him to verify its accurateness as they go, rather than having to email versions back and forth. Sending these diagrams to customers helps them wrap their head around the solution Sam is proposing, allowing them to feel more confident in DocuSign’s abilities and more comfortable moving forward with the sales process. And Sam can see the difference in how a deal progresses based on whether or not a diagram is involved. While the process is getting quicker as his template repository grows, Sam currently doesn’t have enough time to be crafting diagrams for every deal he works on in a week. But he recognizes the need to include more diagrams in more sales conversations. Not only does Lucidchart help DocuSign gain customers, but it also helps the company to keep them. Like most companies, DocuSign focuses on customer retention, since customer acquisition is much higher than the cost of maintaining a customer. And they’ve realized that the best way to retain customers is to have a complete knowledge of what a customer is looking for and provide them with a pleasant onboarding experience. Once a customer has approved the diagram created by Sam (or another of many solutions engineers at the company), it’s passed along to the professional services team who is in charge of getting customers up and running with DocuSign. These diagrams inform the team as they start working with a customer on implementation and serve as a part of the customer’s living history in Salesforce. This understanding of a customer before implementation even begins helps the team to provide the optimal onboarding experience. Lucidchart pulls more than just customers out of the weeds. Lucidchart also helps to clarify concepts for DocuSign employees and even Sam himself. “When I find myself failing to grasp a very complicated concept that I may not have been exposed to before, I will structure it out in Lucidchart. That way, I deepen my own understanding of the problem at hand but also have something I can share with my team to explain the idea,” Sam explains. As one of the more technical people on his team, Sam has a folder containing workflows of the deep technical aspects of the product. The folder is shared with DocuSign employees so they can reference how DocuSign’s API handles certain use cases. When non-engineers ask Sam technical questions, he usually responds in the form of a diagram. Clearly, Lucidchart has rescued many DocuSign customers from the weeds. “I’m positive that Lucidchart helps increase our close rate. I would say it moves the needle, increasing our existing close rate by 20%. And it shortens our deal cycle as well,” says Sam. So don’t let your customers get stuck in the weeds. Let Lucidchart add clarity and credibility to your sales process today. Collaborate and create clarity with Lucidchart.